The journey of a lifetime starts with turning of a page. Let’s embark on an epic adventure! The Readathon inspires students to read as much as they can, all for an incredible cause. Reader of the Year Award (at undergraduate and postgraduate level) is instituted for the students who read most number of books and utilize other library resources and services in the most effective manner. The library of Faculty of Commerce has a vast resource base in form of variety of magazines, books and e-books. To promote the benefits of reading to enhance the individual’s personal growth and knowledge as well as to attain an accomplished life. To motivate them to improve their English reading skills, creativity and original thinking. To encourage the students to visit library frequently and develop a taste for variety of subjects. To generate excitement and enthusiasm that will translate into more reading. To inculcate in them a life-long love of reading. The competition is open for all the students. 2 magazines issued from the library and submit a brief note of any 2 articles from the magazines (Typed - Times New Roman, 12 font size) of 500 words minimum to the librarian. He/she should read the article in the library itself. 1 book (other than syllabus, of minimum 100 pages) issued from the library and submit a brief note about the book (Typed - Times New Roman, 12 font size) of 500 words minimum to the librarian. 1 book (syllabus related, of minimum 100 pages) issued from the library and submit a brief note about the book (Typed - Times New Roman, 12 font size) of 500 words minimum to the librarian. Books can be in English, Gujarati or Hindi language. The participant will appear for an interview regarding the magazines and books that he/she has read at the end of the academic term. The winner of the competition shall be awarded with the title ‘Best Reader of the Year’ and shall be felicitated with a certificate as well as a trophy in the Annual Function. Delay in borrowing/submitting the book would lead to negative marking. Participants who meet with the criteria shall also be awarded with certificates and consolation prizes. Participants who read newspapers, e-books, magazines etc. shall be given extra marks. 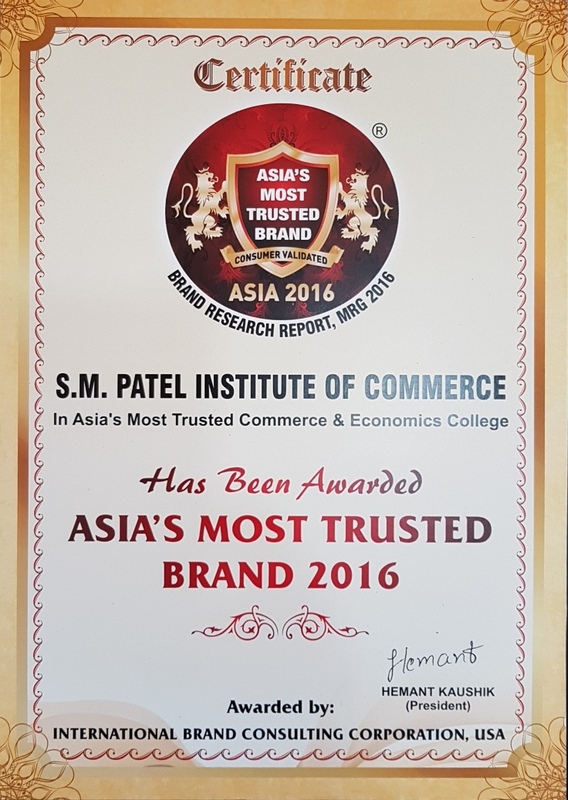 Faculty of Commerce, formerly known as S. M. Patel Institute of Commerce has been awarded ‘Asia’s Most Trusted Brand Award 2016’ in the category of education by IBC INFOMEDIA (A Division of International Brand Consulting Corporation, New Jersey, USA). All the awardees were honoured with trophies and certificates in a glittering ceremony held at Hotel Grand Hyatt, Bangkok, Thailand on 16th April, 2017. Many reputed brands of India and some international brands of China, Thailand, Japan and Singapore like Toyoto, Mitsubishi, DBS Bank were also the recipients of this prestigious award. 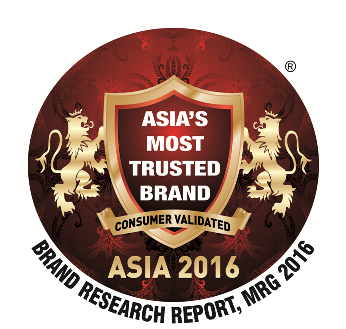 ‘Asia’s Most Trusted Brand Awards’ is a distinctive recognition for a brand recognized as, ‘Most Trusted’ in its industry category. IBC InfoMedia identifies and felicitates all those who have maintained highest standards of product integrity and brand development. Its evaluation process is based on an Asia wide quantitative qualified consumer survey in around 10 major countries of Asia, expert analysis and attributes based qualitative brand research. Faculty of Commerce (SMPIC) was felicitated with a trophy by ICICI Prudential Life Insurance on 23rd November, 2016 for partnering with them to provide long-term careers. This trophy was given especially to acknowledge high participation and absorption of students from the Institute during campus placement. 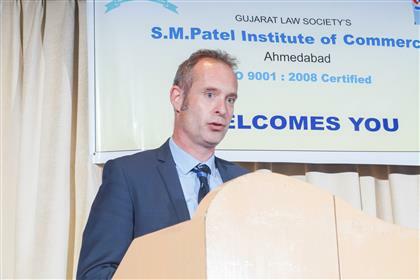 Chartered Institute of Management Accountants (CIMA-UK) has conferred upon S.M. Patel Institute of Commerce, ‘VALUED INSTITUTIONAL PARTNER AWARD- EMERGING MARKET 2015-16'. The award ceremony was held on 29th April, 2016 at ITC HOTEL, MUMBAI. Principal Dr.Ashwin Purohit along with CIMA Co-ordinator CA M.E. Jokhi and Prof. K.P. 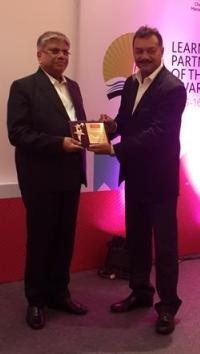 Shah received the prestigious Award from Mr.Bhaskar Ranjan Das –Head of Markets (South Asia), CIMA India. 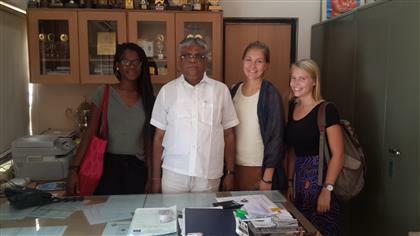 It was a fortifying moment for FOC (SMPIC) when a few students from the prestigious VASSAR College and BROWN College, USA visited the college on 28th November, 2014. 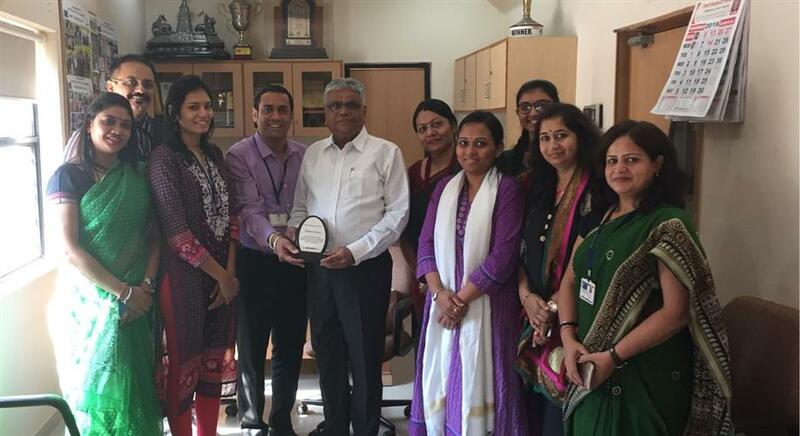 They were here to know about the college as well as to study various issues related to the safety of female students. The students had an interaction with the Dean and the staff and shared their views regarding the issues like harassment of women, ragging, domestic violence and some other matters in this relation. The students’ delegation also toured the college building and interacted with the faculty members to learn about various achievements in academic as well as extra-curricular activities at different levels. Before parting, the students expressed their sense of satisfaction and mentioned that their visit to FOC (SMPIC), one of the top most Commerce Institutes of India, was really an enriching experience for them. The Chartered Institute of Management Accountants (CIMA) has announced a formal partnership with Faculty of Commerce (SMPIC), to provide students an opportunity to study the most relevant international professional qualification for business. A Letter of Intent was signed on 16th October, 2014 by Dr.Ashwin Purohit, Dean FOC (SMPIC) and Mr.Debasish Biswas, Country Head, CIMA in presence of Dr B.H.Joshi, Registrar, Gujarat Law Society. Under this partnership, CIMA and FOC (SMPIC) will launch a study centre at the FOC (SMPIC) campus that will offer CIMA qualification to the students. 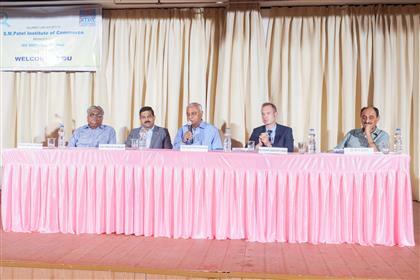 With a view to extend its horizon in the pursuit towards the academic excellence, FOC (SMPIC) took this initiative to explore the possibilities of tie ups, collaboration and linkages with the academic institutes of the international repute in the month of August. 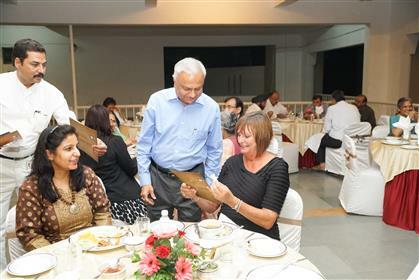 A delegation of the representatives from around 11 member colleges of the AOC,UK, was invited with the help of The Head of Trade and Investment, British Deputy High Commission in India. 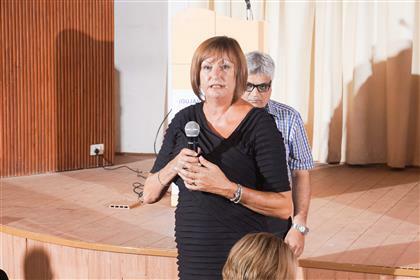 The representatives of the institutes like Burton and South Derbyshire College, Belfest Metropolitan College, Bournville College, Bournemouth & Poole College, Bradford College etc. attended the meet and enthusiastically participated in the interaction. 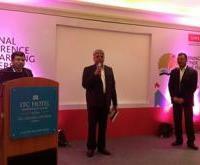 The industry stalwart like Shri Piyushbhai Desai, CMD, WaghBakri Group was also present at the occasion. He insisted on preparing employable graduates with job ready skills. The function concluded with some important discussions and interaction regarding the possibilities to initiate a process to work out MoUs in this direction.